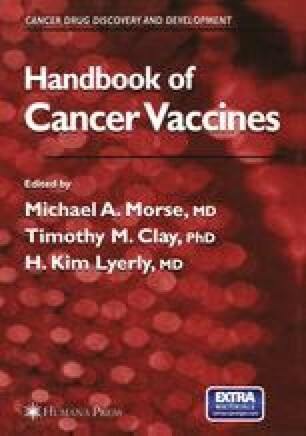 Although identification of tumor antigens has propelled the development of many different approaches to cancer immunotherapy, whole-tumor vaccines continue to be of interest because they contain a large number of antigens, known and unknown, allowing for both widely applicable as well as patient-specific vaccines. Although the presence of a progressing tumor might suggest that whole-tumor cells would not be immunogenic, mouse experiments performed 60 yr ago first demonstrated that tumor cells could elicit immunity and protect syngeneic mice from a subsequent tumor challenge (1,2). In fact, in one model, cell-associated antigen was associated with better presentation of antigen to CD8 T cells than soluble antigen (3). Thus, it is clear that how the immunizations are performed or how modifications are made to the tumor to increase immunogenicity are important for activation of tumor-abrogating immune responses. For example, tumor cells may be injected along with potent inflammatory adjuvants or they may be genetically altered to express cytokines, human leulcocyte antigen (HLA) or costimulatory molecules. This chapter will discuss the scientific basis for whole-cell vaccines, whereas others will discuss cytokine-modified tumor-cell vaccines, haptenated tumors, tumorcell lysates, or shed tumor cell antigens.